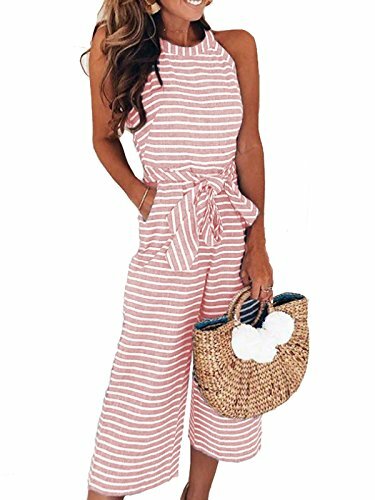 Perfect for sleeping, lounging, and even everyday wear, this stylish striped tee and coordinating loose-fit capri cropped pant set is sure to be a staple in your summer collection. 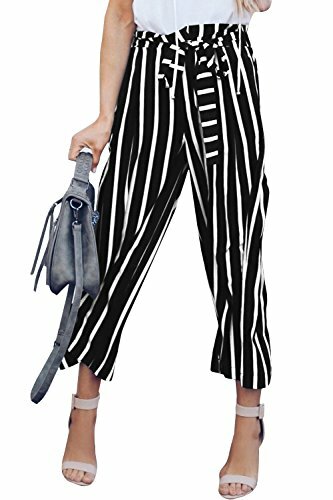 Basic information:Length: Ankle length pantsStyle:BohemianFit Type:LooseClosure Type: Elastic Waist , BeltPattern Type:StripedWaist Type:HighTips:About service: Feel free to contact us if any questions before ordering and after-sale issues. We'll be glad to help!Delivery time:The standard shipping time is about 10-25 business days and the Amazon shipping time is 2-5 business days after sent out.Reviewer: It'll be highly-appreciated for leaving a positive review if satisfied after receiving. We will keep on optimizing our product. 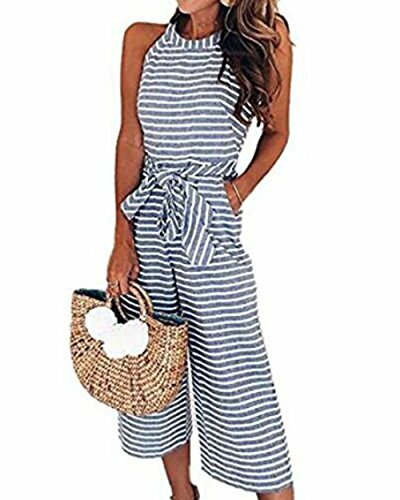 LUBERLIN Womens Striped Waist Belted Jumpsuit Halter Sleeveless Zipper Back Wide Leg Long Pants Jumpsuit Rompers with PocketsBrand: LUBERLINLUBERLIN is US Registered Trademark, we never authorized any other sellers to sell below our listings, we will never take responsibilities for any orders from any other fake and lower price sellers.Polyester and Cotton, Breathable and Comfortable Fabric, 100% Brand New and High QualityComfy and Stretch Style, Waistband is Adjustable, Loose Harem Pants,Capri Pants Spaghetti Strap Top, Flora Print, Striped Design, Zipper Back, Backless, Drawstring Waistband, Sleeveless, Wide Leg Long Pants, Comfy and Stretch Style Size Reference:S: Bust: 87 cm/34.3"-----Waist: 80 cm/31.5"-----Hip: 96 cm/37.8"-----Length: 122 cm/48.0"M: Bust: 92 cm/36.2"-----Waist: 85 cm/33.5"-----Hip: 101 cm/39.8"-----Length: 123.5 cm/48.6"L: Bust: 97 cm/38.2"-----Waist: 90 cm/35.4"-----Hip: 106 cm/41.7"-----Length: 125 cm/49.2"XL: Bust: 102 cm/40.2"-----Waist: 95 cm/37.4"-----Hip: 111 cm/43.7"-----Length: 126.5 cm/49.8"
Size Chart_Black_White: S:Waist:26.0inch,Hip Size:37.0inch,Length:39.0inch. M:Waist:27.6inch,Hip Size:38.6inch,Length:39.4inch. L:Waist:29.1inch,Hip Size:40.2inch,Length:39.8inch. Size Chart_Burgundy: XS:Waist:23.6-35.4inch,Hip Size:37.0inch,Length:37.4inch,Thigh:23.2inch. 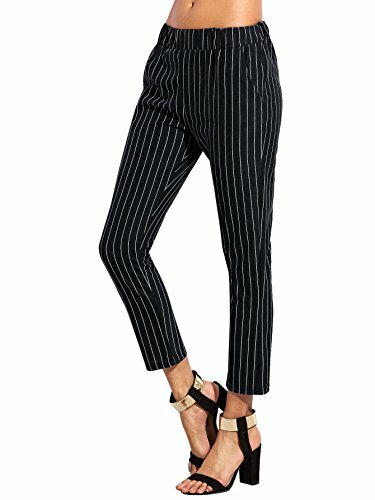 S:Waist:25.2-37.0inch,Hip Size:38.6inch,Length:37.8inch,Thigh:24.0inch. M:Waist:26.8-38.6inch,Hip Size:40.2inch,Length:38.2inch,Thigh:24.8inch. 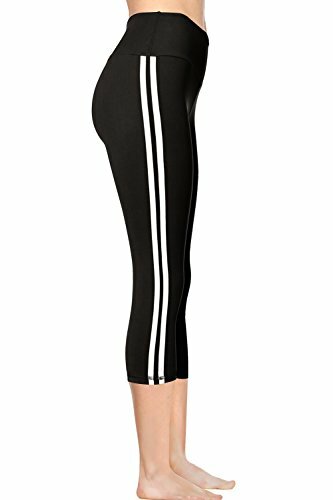 L:Waist:28.3-40.2inch,Hip Size:41.7inch,Length:38.6inch,Thigh:25.6inch.